Left to Right Omar Khedragha tanslator, Mr. Jose Maxwell Argentinian Ambassador, Mr. Enrique Meyer Argentinian Tourism Minister Ghassan Kabbara prospower G.M. His Excellency, the Argentinean Minister of Tourism Mr. Enrique Meyer was the guest of honour in the reception that was held at Arjaan Rotana Hotel in Rawche Beirut. Present at the reception, was His Excellency the Lebanese Minister of Tourism Mr. Fadi Abboud and many other Ambassadors of South American Countries and Spain in Lebanon. During the reception, the Argentinean Minister of Tourism gave some statistics about Tourism in Argentina and encouraged the bi-lateral touristic and investment relations between Argentina and Lebanon. 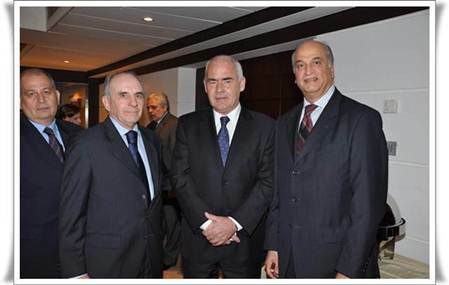 At the reception held by the Ambassador of Argentina in Lebanon; Mr. Jose Maxwell introduced Ghassan Kabbara (General Manager of Prospower) to H.E. the Minister and recommended that Argentina and other Latin American countries should take the opportunity to be present in the international trade fair TITF 2011 which will be held at Rachid Karami International Fairgrounds, Tripoli Lebanon from 21 to 25 September 2011.